This is my Wendy. WINDKIST GONE AWOL, sired by CH WINDKIST STRIKE ZONE and out of my CH WILLWOODS GONE AWOL. 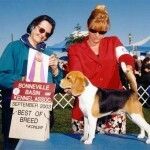 Wendy is pictured taking a Best of Variety at Bonneville Basin Kennel Association. The judge is Linda Scanlon and the handler is Wendy’s co-breeder, Leah Bertagnoli. My usual puppy prices vary and are between $1,200 and $2,500. 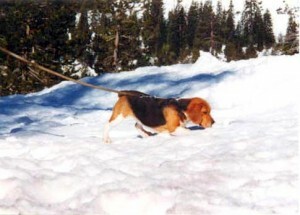 A Beagle puppy that I consider to be pet quality I price, $1,200. Pets go with Limited AKC Registration (no breeding, no dog shows, to be spayed/neutered by 6 months of age). 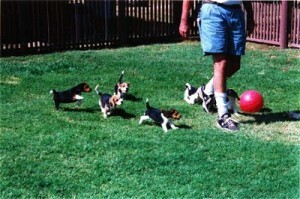 Beagle puppies that are nice enough to breed and/or to show are priced between $1,500 to $2,500. Puppies at the high end of the scale have an AKC Champion sire and an AKC Champion dam as parents. These top quality youngsters go with Full AKC Registration (no restrictions). Each litter has a champion sire (or if the sire is not yet a champion he is currently being shown) and some litters also have a champion dam. All my puppies are sold with a written contract that shows my guarantees and also what I expect from my puppy buyers. Each puppy has an injected microchip for permanent identification and will not leave here until after they get their first combination vaccination at 8 weeks of age. The shot record that goes with each puppy shows what shots/wormings the puppy has had and also what will be needed for the first 6 months. Dew claws are removed when the puppies are about three days old.